There is no substitute for live, in-person events for small business owners. From small business conferences to trade shows, there are many reasons to get out there for face-to-face networking opportunities. Focus your effort on implementing these powerful tactics to ensure a winning trade show. Sometimes an unrelated show to your target market can be the best exposure opportunity. Nordic Track had huge success not at fitness shows, but at dental trade shows. Choose unrelated shows, and stand out, making sure the demographics are correct. Companies running the show may over-hype their event. Talk to the businesses who have attended several trade shows. Use this information to guide your trade show exhibit attendance decision. New trade shows are untested venues. Small businesses have limited time and money to experiment on unknowns. Save your cash for the regular, proven shows in your industry. Every trade show is not equally useful for every small business. Take your time to research each possible trade show to determine how it will benefit your business. Ultimately, you should only invest in shows that reach the key decision-makers of your target market. Months prior to the trade show, spend time informing existing clients and your market of the upcoming show. Use the show as a platform for a new product or service launch. Make sure you leverage low-cost online marketing tactics to get the buzz started. If the budget is tight this year, don't spend on trade show exhibits. Capitalize on the trade show by being a speaker or a panel expert. This will add credibility to your business and attract potential leads. Good trade show organizers will want your business to have success and come back next year. Contact the management team for help with developing an appealing booth, staff scheduling, and marketing campaigning prior to the show kick-off. Trade shows are unlike other sales environments. Limited time and attention of attendees requires quick qualifying, and lead generating tactics. Make sure your staff is prepared and has a clear goal for each day. Sales staff frequently make the mistake of contacting trade show leads, months after the show. Make sure your sales staff have extra time and incentive to follow-up with all leads within weeks of your trade show exhibit. Entrepreneur, Joseph Cossman, was a master of promotion. To create a buzz around his new toy spud gun at a big toy show, Cossman, ordered hundred's of pounds of potatoes and invited the local orphanage to come and play. The Spud Gun was the hit of the show. Use drama and flair to have your small business stand above the competition. 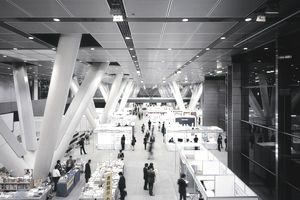 Trade shows still continue to be big business for all businesses. In a world of websites, email messages, text messages and voice mails, trade shows offer one of the true opportunities to build relationships with face-to-face contact -- something every business can use a little more of.